The hedge is lopped, and its trimmings need to dry out enough to burn. They’re lurking on the bit of frozen path I need to mattock for the new shed siting. I could try to rush it. Or, I could focus on something else. Making my own compost in this case. Even though I recycle as much as I can, I use a fair amount of new compost for pots and tubs each year. Between 375-500L in total, which feels fairly shocking when I see it written down. 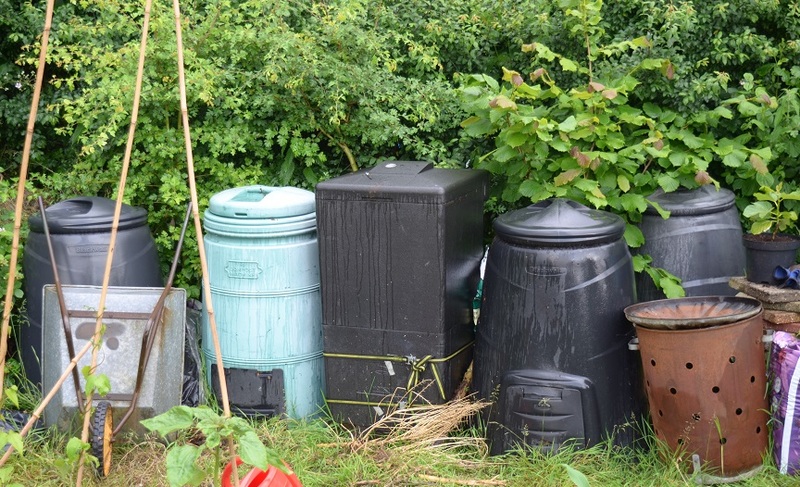 When I started growing I gave no thought to standard multipurpose compost – it’s what all allotmenteers seemed to use. Assuming it was all fine I bought bag after cut-price bag. Then I read a bit, and decided I wanted to cut down on peat. This year, as a tester, I grew plants side-by-side in pots of B&Q peaty compost and peat-free SylvaGrow. And, shock horror, bar a slightly different watering regime, it made No Real Difference! I then read a bit more and my challenge for 2017 is to go 100% peat-free. After all, Monty Don does it. There are some linked articles at the bottom which put the arguments for growing peat-free better than I can – in our infinite wisdom we’ve dug up over 95% of our peat bogs for compost which makes the remaining fraction incredibly rare and vulnerable. Domestic gardeners, like me, who are ironically usually more in favour of doing no harm, use 66% of the peat-based compost on the market. 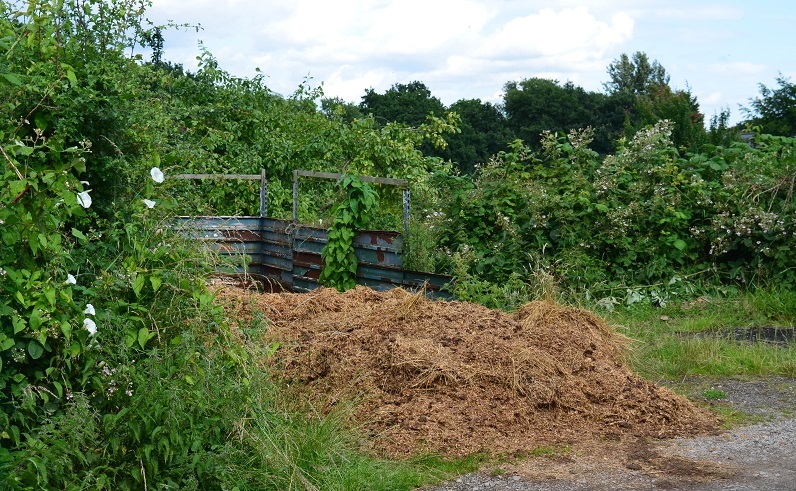 The caveat being that for bulk composting you need a fair amount of space for the material to rot down. I have a small family of plastic composters lining my path, which I hope will result in about 400L of garden compost next year. 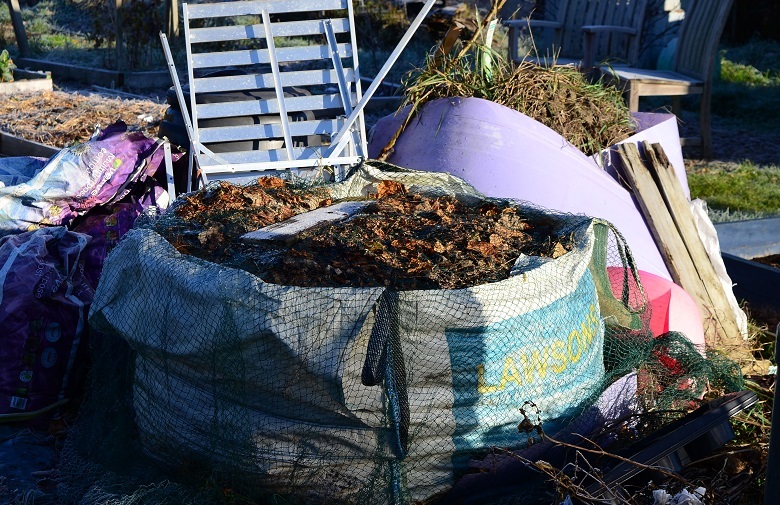 Last year’s 4 huge builders’ bags of leaves rotted down into 5 bags of unsieved leafmould for sowing seeds (see the Monty Don recipes on the link below if you’re interested in doing the same). I now have another 2 builder’s bags, piled high from this year and netted against the winds, to sit and quietly turn to friable loveliness. Behind those is Sod Mountain, slowly changing from grassy turves into loam – I hope! Bulk ingredients aren’t a problem: spent coffee grounds from Waitrose, matured ashes from last year’s bonfire, barrows of fresh manure, well-rotted woodchip from the paths between my beds, enthusiastic comfrey plants, nettles a-plenty, dead/dying/finished plants from the plot, our kitchen scraps bin and the occasional bucket of dilute liquid gold – as long as I don’t misplace my strategic milk churn! I had a good source of spent hops from the brewery behind The Antelope, but daftly let that one slide and now need to pick it up again. Given I am one of the site’s Official Mowers there could be grass clippings too, but now horsetail has made it into the main path, I’m less keen on using them. What I am struggling with a bit is keeping the core temperature high enough for speedy composting. Admittedly this is winter and I can’t expect worms and microbes to be as focused on their jobs. I won’t have enough of my own compost ready in 2017 to use for all my plants, and my sieving skills need practice. Fortunately I got pointed toward SylvaGrow compost, which is lovely stuff and I can pick it up from RHS Wisley when I visit, though I really wish my local Squires would stock it. I shouldn’t feel nervous about this, but I do! Wish me luck…I’m off to buy a big sieve for riddling my leafmould. Brilliant! My sister works at Forsinard Flows – a huge peatland landscape. They are trying to preserve it. Maybe I should suggest to her that they organise a how-to-make-compost workshop to minimise the amount of peat compost that people buy in! That’s a fantastic idea. One of the reasons I put off doing it till now was a fear of getting it all wrong and killing my plants. Good luck with this. Over the years I’ve bought less and less peat based compost (maybe about 10% of my overall in 2015), instead using home made compost, some bought peat free compost and John Innes for more select purposes. This year I’ll be completely peat free, with some good loam already to use and thankfully plenty of compost(ing) materials to hand. Thanks -it’s nice to realise I’m in good company. I’ve a few bags of SylvaGrow coming which buys me time to mix my own compost blend for planting into. 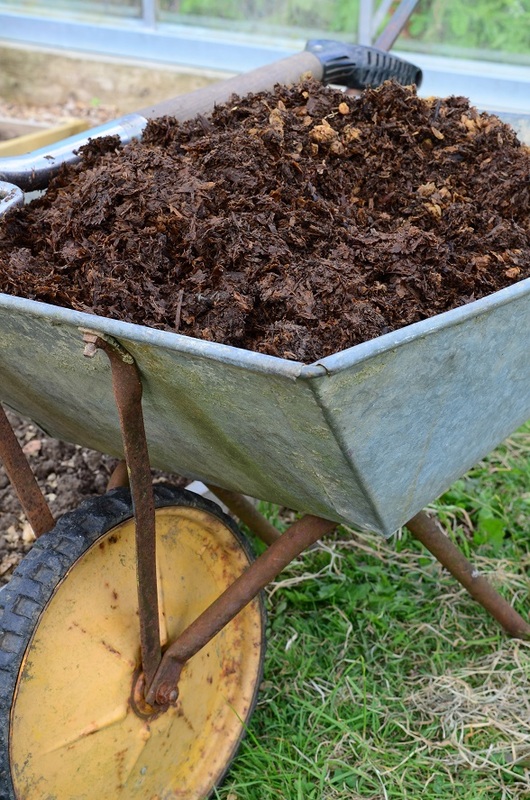 Hi Beryl – I’m doing a spot of volunteer gardening at Ordsall Hall in Salford a couple of days a week and the head gardener there, Lindsay Berry, orders peat-free compost from http://www.compostdirect.com. I think it’s their ‘black gold’ that she gets in (I’ll double-check when I’m there today). Bonus item: it’s delivered in a 900l bulk bag, which gives you another leaf collection receptacle for next year. I might have to put a big bag of manure onto Santa wishlist! Welcome to the peat-free club! I haven’t used it for years. I make lots of compost – at last count eight bins of varying sizes – and buy only peat-free compost. Have you tried Dalefoot products? I trialled some and wrote a post about it earlier this year. Not a cheap alternative but I found it really good. Hi – and no I haven’t yet. It’s a bit steep pricewise, though I might go for it one day for seed compost. Good to know I have plenty of company in peat-free growing though. I expect I’ll have a few questions about mixing next season! PS I think Charles Dowding also does a day course in compost making, should anyone be interested. He’s particularly expert at getting those high temperatures going. If you ever have one, the hotbin people are also very good. I think I am expecting too much of my worms and enzymes in this weather. It’s beautifully frosty again today. This makes a fascinating read, Beryl. I’ve been buying peat-free sheeps wool/bracken compost from Dalesfoot which is excellent, but the costs add up. It would be great to be self-sufficient! At the moment I do have 2 wormeries and 2 Bokashi bins, which deal with all the kitchen waste. Ive been mixing that into spent potato bag compost to use as a mulch. I’ve got a small ring of chicken wire that the leaves go into, but I’ve not yet done anything with the results. And I’ve got a mountain of 2 year old turf, which I removed when I made my raised bed area. The challenge is to find the best way to combine everything effectively and efficiently. Your links above are very useful, thank you! Thanks, that really kind. I’ll get a couple of bags of SylvaGrow to help my own stocks, particularly at the beginning of the year when everything else is hopefully still frozen into lumps. Sounds like you’ve got a good amount of material too.